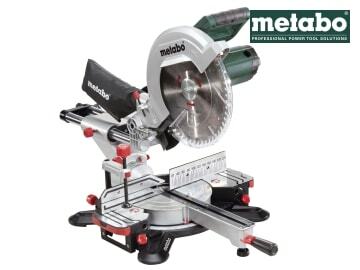 The Metabo KGS 305M Cross Cut Mitre Saw has a compact, light weight design with a one-handed transport design feature. 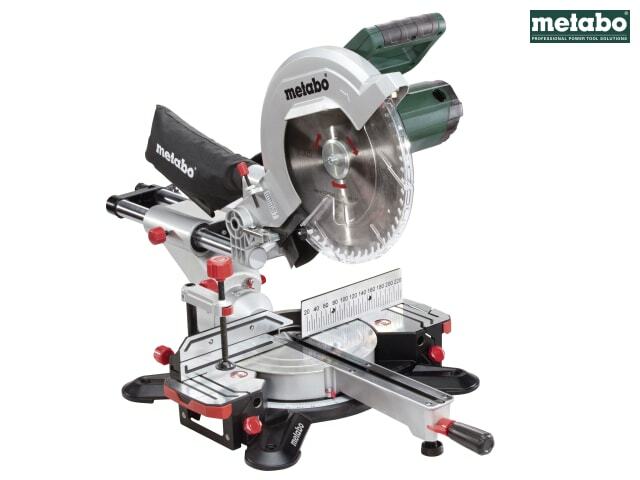 Offers enormous cutting performance due to the extremely powerful universal motor and large saw blade. With a sliding function for wide work pieces. Easy saw blade change by means of a spindle lock: No dismantling of the pendulum protective cover required. Easily transported thanks to the ergonomically-designed handles and saw head lock. It has a robust die-cast aluminium design for the highest demands and offers effective dust extraction via an integrated dust scoop. Starting current limitation prevents the actuation of the lock on start-up. The saw offers fast and precise setting of common angles using stop points with a laser for exact display of the cutting line (mains powered, no batteries required). Infinitely extendable table width extension, removable to put long panels, slabs etc. Underneath. The bright LED work light provides illumination of the cutting line (mains powered, no batteries required). For safe sawing it has high sliding rear fence profiles and a material clamp for secure fixing of the work piece from the top or front. The saw head can be inclined to the left, with additional angle range for undercuts. All scales and operating elements are visible from the working position and can be operated intuitively.